It’s four o’clock pm and the second cup of coffee I’m sipping on is finally making me feel like a person again. Who knew motherhood was so tiring? Oh, wait…everyone and their sister knows that. Well, I’m really feeling it this week. It is days like these that I wish we were living a little closer to home. It sure would be nice to be able to take K Baby to the grandparents! 😉 If I had that option, I would do things like laundry and school work or perhaps I’d just sleep (I would never waste that opportunity by blogging). I shouldn’t complain. 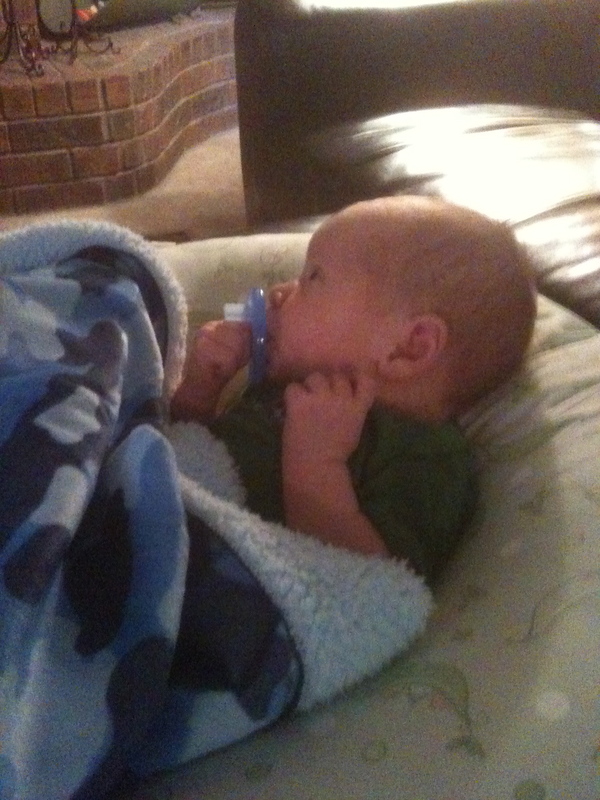 Little man only woke up once last night to eat! It didn’t matter much, though because I still woke up wondering why he wasn’t waking up. Ha! Oh, the joys of motherhood. I had to take him to the doctor today because he has some eye goop. Apparently, it’s not a big deal and with the help of some gel, he’ll be good to go in no time. If only I could figure out how to get it in his eye. I wish I could say this is the last of our hospital visits for awhile, but I have to return tomorrow. We should probably just rent out a room in the basement as much as we’re there. 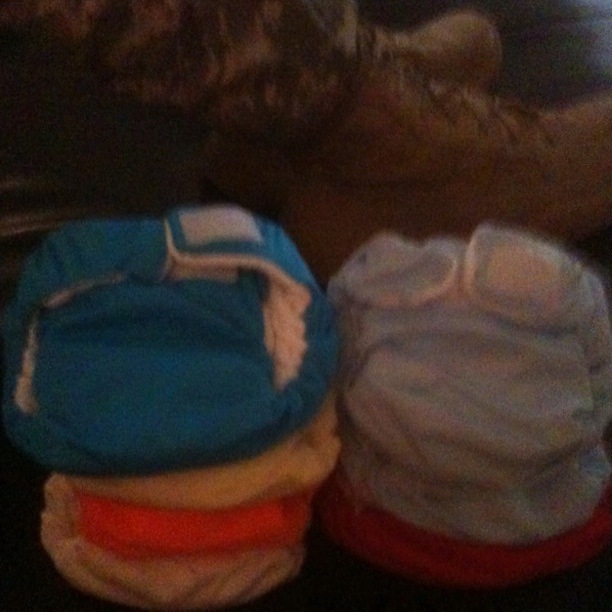 Anyway, we started cloth diapering yesterday thanks to a pal I met here in Louisiana. She let me borrow the diapers she made for her daughter to see if we like doing it and if it’s something that will work for us. Yeah..you read that right…she made them. I was impressed, too. Domestic goddess. 🙂 Her first time sewing…EVER…and she made diapers. Brave woman. We like it so far. 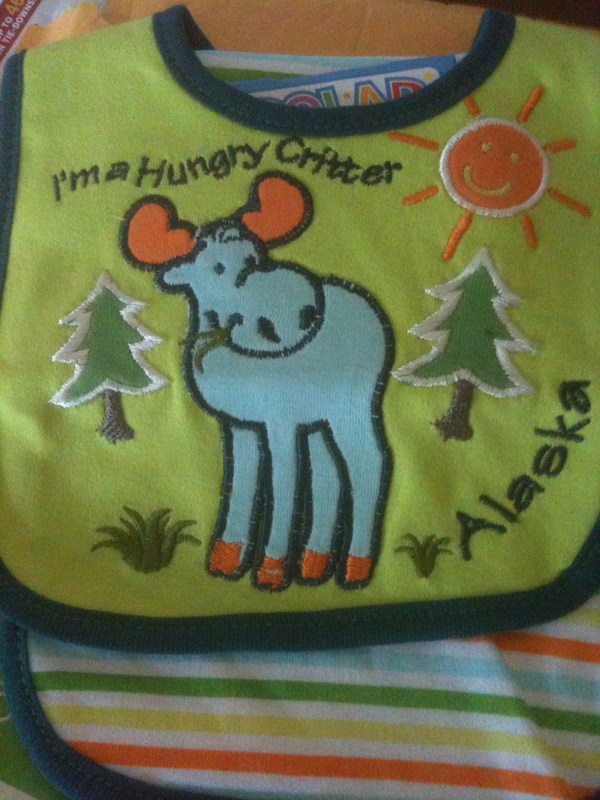 A bib for Baby K from a bloggy pal- Thanks, lady! My blog has allowed me contact with people all over the country and I’m happy to call you all friends. It means a lot that you all keep up with us which is why I’m writing to you right now, instead of writing a case study for class. It’s called priorities people…I got em! Now, I must run. Other priorities are calling my name (Read: my husband wants Ramen Noodles). I’ll be back before too long…hopefully with more interesting content. It’s just that my brain is barely functioning right now. Forgive me? I feel disconnected from the blogging world. School, family, moving- these are all taking me away from you momentarily. Still, I enjoy having a place to share our lives with all of you. It allows me to revisit many of my fondest memories, especially when I have little recollection of them. I have a terrible memory in case you didn’t know. Sometimes I like this about myself. For instance, I can watch a movie a handful of times and still not remember what happens in the end. It’s great! It’s new to me each time. Other times, this pesky memory problem isn’t so enjoyable. I think I’m talking writing too much. Whoa! That’s one big belly. People keep telling me that it’s only going to get bigger and that’s something that scares me to hear. How? How can it get any bigger? You should see me try to execute an escape- from- the- air- mattress plan. It ain’t pretty. It usually involves a calculated roll with some preliminary swinging of the legs to roll me over. If all goes well, my knees end up on the floor while I use my hands to push me up. All the while, I’m breathing like I’m about 600 lbs. and just tried to hula hoop. My hair is usually a mess because I no longer care about brushing it. I’m just trying to get through the day (or the night, for that matter). When I finally make my way to a vertical position, I still have to cradle my huge belly as I high tail it to the bathroom because you know I have to pee every few minutes. 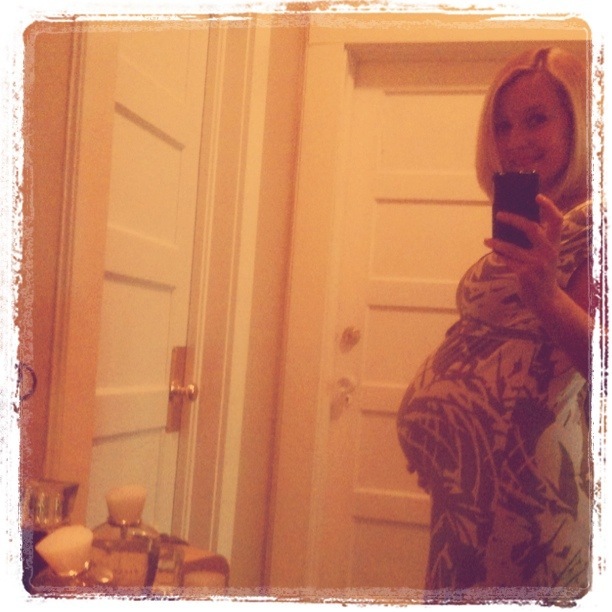 Long story short- I’m wondering how anyone can view pregnancy as an attractive time period in a woman’s life. Sometimes I feel sorry for Captain J to have to wake up to such a hot mess every morning, but then I remember that he can be thanked for this huge protruding belly of mine and I get over that pretty quickly. 65 more days to go! A bloggy pal recently published a post about why she blogged. I responded to her, but after a certain annoyance today in my life, I decided to elaborate here because it is such a good question. I was actually asked this very question today by someone else, too. 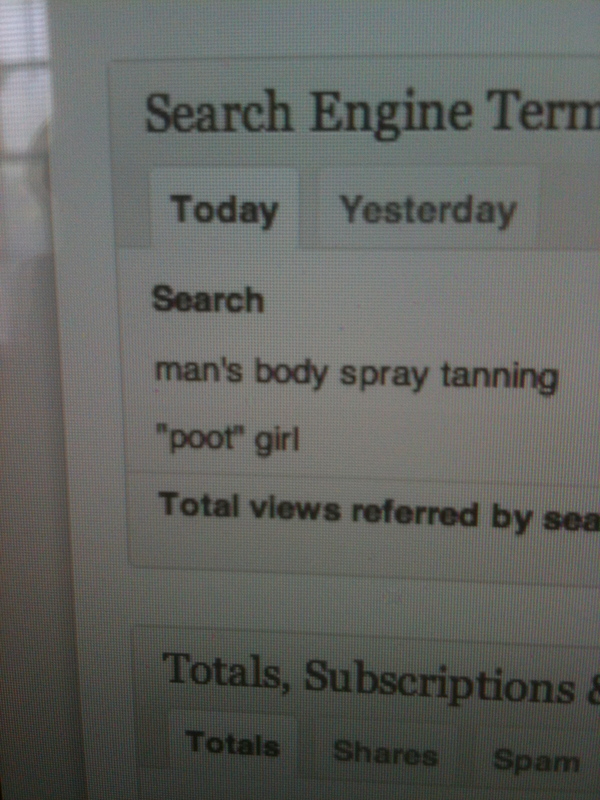 What can I say, the people want to know! I started this little blog, formerly called Confessions of a Snowbunny, to document my life in Alaska and allow my friends and family to keep up with me. For awhile, this answer was accurate. Then, magically, I started making connections with other bloggers who I didn’t know in real life, some of which I can now consider friends. My answer began to expand. I wasn’t just writing to document my life; I was writing to create more connections all around the world. Isn’t the internet great? Now, I write to keep myself sane. I write and speak my mind here and worry little about what others think because it’s my blog and if they don’t like it, they’re free to leave. This is my space. Please don’t get me wrong, I love hearing what you all have to say. Your responses and daily reading are awesome! I just don’t feel the need to edit myself here and that’s a great feeling. I blog what I want, when I want. It keeps me entertained. It keeps my brain tickin’. And hopefully, at times, it makes you laugh. With that said, I’d like to invite all of you to join in on our latest hot topic with the ladies of (Mil)ing It Over at Chances I’m Taking. The linky is up through Sunday so we’d love to have you. Remember- feel free to speak your mind afterall it is your blog! Military or not, we’d love to hear what you have to say. What are your benefits of blogging? Check back in tomorrow to see what’s lurking on my phone! As always, thank you for reading my silly little corner of the internet. I’m glad to have you here! I thought, ‘how perfect’! I read on to see an additional quote below it for the same day that says, “Words are little things, but they strike hard.” This second part solidified the deal–I have to write today. I have to write about what is on my mind and that is the topic of forgiveness. I must say, it’s something I need to work on. From a young age, I typically allowed people to walk all over me. I rarely stood up for myself when I was being used in some way and I neglected to speak my mind when I thought doing so might step on someone’s toes. No one bullied me or anything, but some people in their own little ways would abuse my friendship and my trust which in turn made me weary of trusting many people. I’ll admit, the older I got, the more my strong, independent, and opinionated sister rubbed off on me to which I’m forever grateful. I started noticing that people would listen to the quiet girl when she passionately declared what was on her mind. I began to feel more secure and confident in my own voice. But I will say, that side of me only comes out when I truly feel the need to speak about a certain topic. I prefer to be the one who listens to everyone talk, soaks in their opinions, and formulates my own ideas. I don’t mind if people think I have nothing interesting to add. I don’t care at all because being the center of attention isn’t something I need or ever really desire in large groups. I enjoy keeping to myself when I should and speaking out when it is necessary. Perhaps this is just an example of my introverted qualities revealing themselves. Either way, I’ll say that I don’t understand why people choose to do the opposite. When did America stop telling its kids “If you can’t say something good, don’t say anything at all”? I don’t understand. I’ve been hurt many times by people who say hurtful things or just downright lie to me or about me. Fine, I can deal with your shortcomings. Heck, we all have them! But I’m not so good with the second part that comes along with toleration, you know, the forgiveness part. I am a Christian and I know that God forgives me daily so why is it so difficult for me to practice forgiveness? I don’t know, but it is. I guess I can forgive. I just never forget which is not true forgiveness. God wipes my slate clean each time I ask him. I should be able to do this to those who hurt me. Matthew 18:21- Then Peter came to him and said, “Lord, how many times must I forgive my brother who sins against me? As many as seven times?” 18:22 Jesus said to him, “Not seven times, I tell you, but seventy-seven times! 77 times actually means an unlimited amount of times. Wait, a second, I’m supposed to continually forgive? WHAT IS THIS?! I think I hide behind use the fact that I do not forget when I’m wronged as a defense mechanism. This way, I won’t be surprised when I’m hurt by this person again or others who may let me down along the way. I won’t take anything they say too personally the second time around because they’ve already slightly been written off by me. How incredibly mean of me? I’m not perfect and this is one thing, of many, that I struggle with. I’m not saying I automatically don’t trust you anymore if you lie to me about liking my outfit or if you take my favorite shirt and neglect to return it for months. I’m talking about bigger things such as insulting who I am or downright lying about things I’ve said or done. I find people who do/say such things less credible each time. I can go about life as if nothing happened to the rest of the world, but somewhere deep inside I’ll likely never forget. Is it wrong? Yes and it’s something that I pray about quite frequently. But on the other hand, more people should realize that words have consequences. 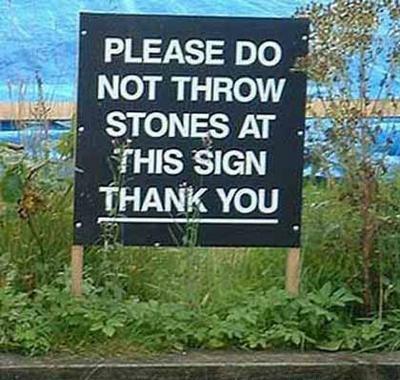 Merely posting this nonsense is beckoning trouble makers all over the place to throw rocks at this sign. It might as well read “Please, oh please, find the biggest stone you can find and toss it at this sign.” Our words, our actions do not go unnoticed nor do they slide by without the smallest repurcussions. Way back in 1905, a sentence was printed in a little red book whose words still ring true today: “Words are little things, but they strike hard.” May we all be mindful of how each statement and each action can affect those around us. May we realize that our words have consequences. 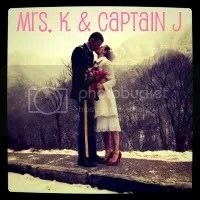 It is my hope in writing this blog for the world to see that I offend no one, but still manage to shed light on what goes on in the mind of Mrs. K 🙂 Perhaps this is a lofty goal, but that’s what I’m aiming for. I’d love to hear what you have to say. How are YOU with forgiveness? In honor of my fairly new blog reaching celebrity status over 3,000 visits today, I want to tell you a little about why I started blogging. If you’ve browsed around my website at all, you know I write basically because I’m bored and because I’d like to keep my family in the loop of my life. I think blogging can be so much more than that, though. This is why I sometimes spend hours browsing around and reading peoples’ stories. I love sitting in my little cabin imagining the daily happenings of somewhat “normal” people just like me. Each of the people I get to converse with are seemingly “normal” individuals to the rest of the world, but to me they’re just as abnormal and quirky as I can be. My favorite blogs are about real people who are living life however it is that they want to. Some are in the midst of BIG things and some are just typing throughout their lunch break, but each entry is something I look forward to. I hope that’s what I’ve created here- a place to come when you need a laugh or when you’re insanely bored. The internet is good for that. Trust me, I’m an expert on the topic.